We are students in a Master’s program at University of Camilo Jose Cela in Spain, where we are physiotherapists. 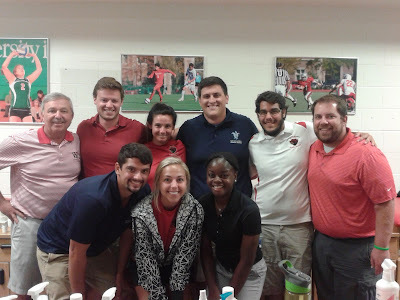 For our internship experience for we chose to learn about Athletic Training in the United States, in the city of Saint Louis, Missouri at Saint Louis University (SLU). SLU has an affiliation agreement with Washington University where we learned at practices with their football team under the supervision of Rick Larsen ATC. 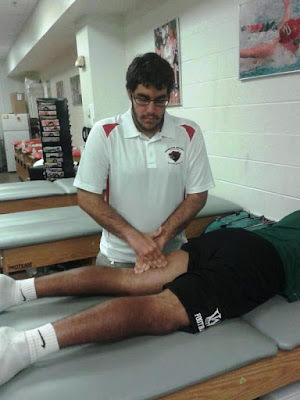 The goal of this experience was to learn more about Athletic Training, which is different that is seen as a sports physiotherapist + a sports rehab worker in Spain. 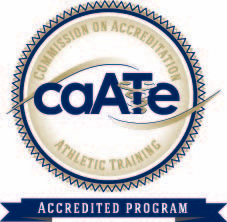 It seemed important to get this experience, see how they work on another continent, see the profession of Athletic Training and improve our level of English. Each day we started in the Athletic Training Room preparing players for the training or the match/game they had to play. In this room, the players came to tape both ankles and wrists, dress skin wounds or more substantial injuries such as fractures or muscle tears. We also had the opportunity to learn how to teach with Rick Larsen with the other students in the SLU Athletic Training Program. 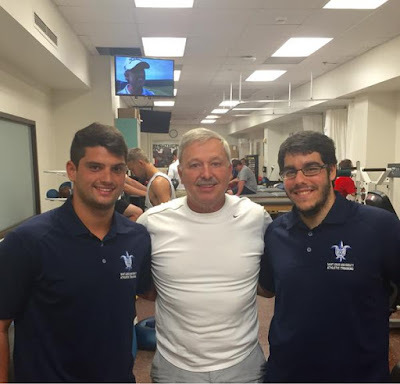 We were given the opportunity to provide a demonstration of aquatic therapy by Javier Gonzalez Vazquez or a myofascial technique on two players by Carlos Cachon Romero. 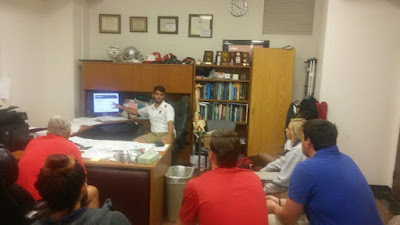 Once finalized the work in the Athletic Training Room , we went to the field to prepare everything for the players, water from carts , ice for players, CPR/AED case , even a mini weather station to monitor the time if a storm was coming (which happened and we had to stop training as a precaution). We were also alert for any serious incident that may occur instantly and we were ready to act as quickly as possible to have the situation under control. Also we taped players (or re-taped since were released by sweat), we performed stretching to the players and some other tasks on the football field. 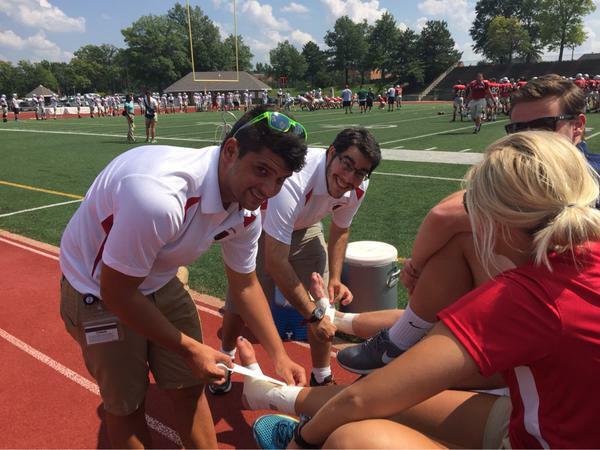 You could say that this was a ''practical'' for game day where we worked to keep our athletes constantly hydrated, and be alert to any danger that might occur during the game. In short, these practices have helped us to improve as professionals of tomorrow in our clinical practice, see how it works out of Spain and also learn different techniques to those already used to improve our English on everything and have a different view. 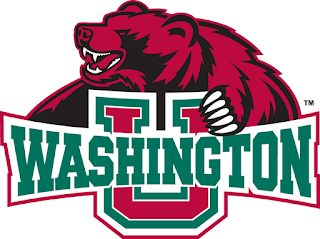 We appreciate this opportunity provided by both to Universidad Camilo José Cela (Program Director Alvaro Garcia Romero); Saint Louis University (Program Director Dr. Anthony Breitbach); and Washington University, especially our preceptor Rick Larsen, for hosting us here in the United States. Para nuestra experiencia de prácticas del máster que estamos realizando en España como fisioterapeutas, hemos elegido realizar esta estancia de prácticas en los Estados Unidos de América, en el estado de San Luis en Saint Louis University, la cual tiene un convenio con Washington University donde realizamos las practicas con el equipo de futbol americano (Bears) bajo la supervisión de Rick Larsen. Estas prácticas van encaminadas a la figura del Athletic Training que se ve como un fisioterapeuta deportivo + un readaptador deportivo por lo cual nos pareció importante realizar dichas prácticas para así ver cómo trabajan en otro continente, ver la figura del Athletic Training y mejorar el nivel de inglés. Cada día que íbamos estábamos en la habitación de Athletic Training tratando y preparando a los jugadores para el entreno ó el partido que tuviesen que disputar. En esta habitación, venían los jugadores a vendarse tanto tobillos como muñecas, curarse heridas en la piel o alguna lesión más considerable como pudiesen ser fracturas o roturas musculares. Hemos tenido la oportunidad de aprender como de enseñar puesto que junto a Rick Larsen como a los demás alumnos del programa de Athletic training nos dieron la oportunidad de demostrar lo que valemos ya sea como una exposición del TFG por Javier González Vázquez o por realizar una técnica miofascial en los isquiotibiales a dos jugadores por Carlos Cachón Romero. Una vez que finalizaba el trabajo en la sala de Athletic Training, salíamos al campo a preparar todo lo necesario para los jugadores, desde los carritos de agua, hielo para los jugadores, maletín de RCP, incluso una mini estación meteorológica para controlar el tiempo por si se acercaba alguna tormenta (cosa que sucedió y tuvimos que parar el entrenamiento por precaución). En resumen, estas prácticas nos han servido para mejorar como profesionales el día de mañana en nuestra práctica clínica, ver como se trabaja fuera de España y a la vez aprender técnicas distintas a las ya utilizadas, mejorar nuestro ingles sobre todo y tener otra visión diferente del jugador. Muchísimas gracias por esta oportunidad tanto a la universidad Camilo José Cela (Álvaro García Romero), Saint Luis University (Anthony Breitbach), a Washington Univeristy y sobre todo a nuestro tutor en las practicas Rick Larsen por acogernos como uno más en su equipo.